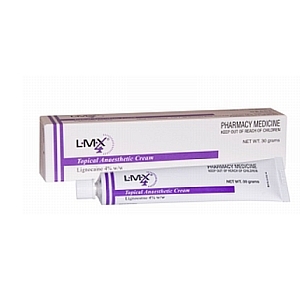 LMX4 is a new advanced topical anaesthetic that has an excellent safety profile. LMX4 is used by physicians and health professionals to numb the skin prior to performing cosmetic procedures, collecting blood specimens or placing IV cannulas and such procedures. This product is now approved for use by Queensland health , a cost effective alternative to Emla. Apply a small amount and massage in. Cover the area to be anaesthetised with a thick layer of cream and cover if required with an occlusive dressing.Wait for at least 30 minutes for local anaesthetic to take effect. If skin irritation occurs, stop immediately and seek medical attention.